Bruce Is The Boss, Mike Is The Bomb. Last Thursday was shaping up to be a pretty nondescript day. Eli stays home on Thursdays, so we’re usually in our pajamas long past a reasonable hour. We get dressed, go to swim lessons, do some laundry and that usually sums up our day. Besides the usual, I planned to get some homemade Pop Tarts made so I could finally blog about them, and I knew I needed to get dinner prepped as I had to work at 6. Mike woke me up that morning and the first words out of my mouth were, “You’re wearing that to work?” In my sleepy haze I noticed he was wearing a Nashville Predators t-shirt, which is definitely not work attire. I had an inkling that he might be scheming something. Our 15th anniversary is coming up in May. He’d been overly interested in the calendar lately, and I spied him pulling my parents aside on Easter for a longish conversation. Still, this randomness on a Thursday caught me off guard. I didn’t really know that much. He proceeded to get Eli off to school, leaving me with instructions to pack an overnight bag for myself, a bag for the kids, and to stay off any and all social media. Elena watched me like a hawk – she was in on the surprise and wasn’t going to let me sneak any peeks. By 9 a.m. we were on the road, to where I hadn’t a clue. I’m not a die-hard Bruce Springsteen fan. There are songs life-long fans would be ashamed that I didn’t know every word to. 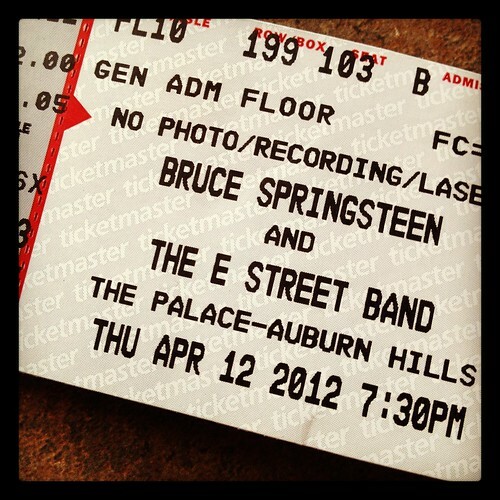 But for years now I’ve said that I’d love to see The Boss in concert. It was on my imaginary bucket list. Words that I’d said in passing, “Someday I’d love to … maybe one day … if he ever comes to Indy … wouldn’t it be awesome?” My amazing husband took my wishes and what ifs and made them a reality. This is incredible on so many levels, but what really stands out for me is that he’s not a Bruce fan (let me clarify: he wasn’t a Bruce fan). My rock star husband pulled off an enormous surprise, rearranged school schedules, swim lessons, arranged child care, got me off from work and drove 10 hours in 2 days to take me to a concert he doesn’t really even care for. If that’s not love, I don’t know what is. Sure as the turnin’ of the night into day. I hope that you’re comin’ to stay. It was beyond amazing. 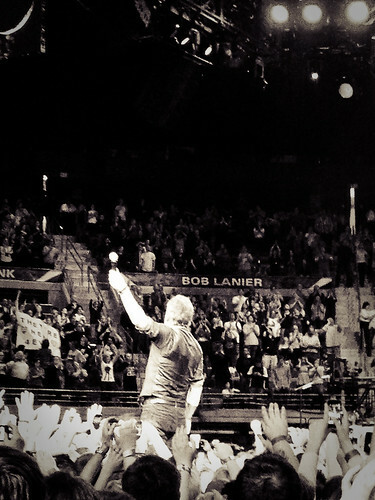 Bruce played non-stop for 3 1/2 hours, running around like a mad man, each song sounding better than the last. He’s 62 going on 22. This? Is over 3 hours in. I was ready to pass out. The Boss is still going strong. It was epic, and I just wanted to cry from happiness. For lyrics and music that have moved me during so many phases of my life. For checking something off my life list that I wasn’t sure would ever happen. And for Mike, who I’ve known and loved for nearly 18 years, but who can still surprise me like no other. He’s The Boss of my heart. Way cool. Give Mike a pat on the back for me. I so need to do something like this for Danny. He is dying to see Van Halen. They are coming to Nashville, but it’s the rehearsal dinner night of his brother’s birthday!